The packaging of the product is absolutely great. I received the item along with another product that I purchase through Amazon. 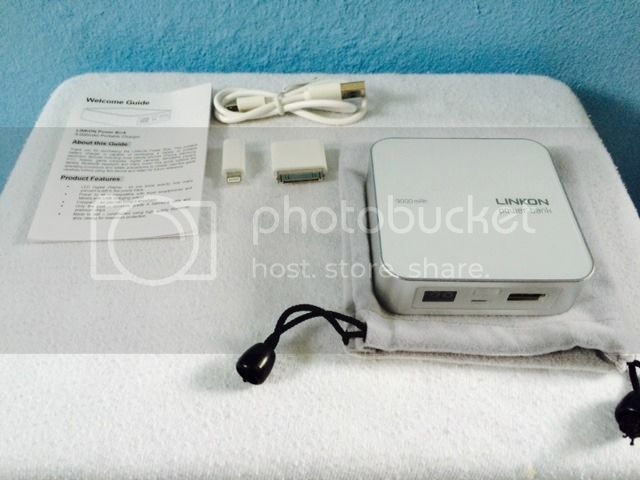 I've tried different types of power bank, however, LINKON power bank has other benefits that other power banks doesn't. First, it is consisted of 9000 mAh a power bank that would last longer while you are charging your devices. I've noticed while charging my iPhone 5s that has only 44% battery left and the power bank has only 50% battery remaining. It only took an hour for my phone to recharge over, which still give the power bank at least 26% power in it. It's also robotically powers on when you plug your phone to the bank it will automatically sync and start charging. It also shuts off when the phone is fully charged. The features it has is just astonishing as it is created for a specific task. It has an LED Digital display so you'll know the percentage left in the power bank. I also like that this power bank can recharge and most compatible to any phones and tablets as it is with a USB charging output. I also adore how it is constructed using high quality Aluminum alloy casing for my maximum protection. Included in the product are the following: 9000 mAh power bank, a small storage bag for an easy way to take the power bank anywhere I go, charging cable with iPhone 4 & 5 Charging tip as well as the welcome guide which I do find very useful with information about Linkon Power Bank. Overall, my experience with 9000 mAh LINKON POWER BANK is great. I like its features as well as the capacity of the power bank itself. This can be purchased through Amazon.com.